BOSTON, Mass. - Two Boston men have been sentenced to life in prison without parole and a woman was given at least 17 years in prison in the murder of a pizza deliveryman, Richel Nova, reports CBS Boston. 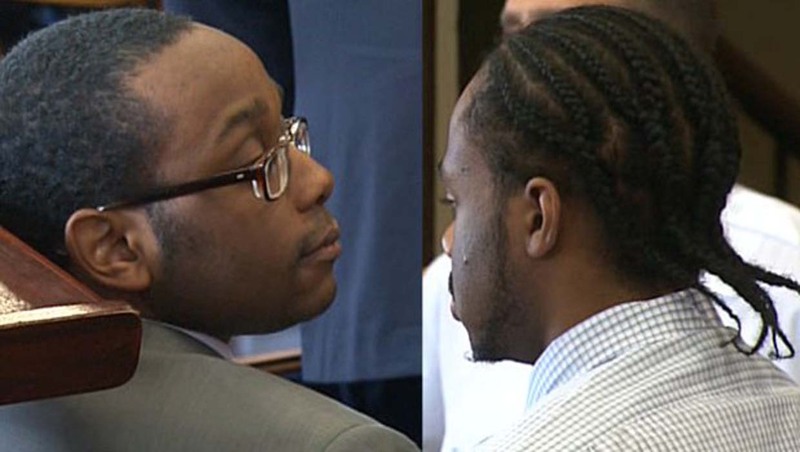 Alexander Gallett and Michel St. Jean were found guilty of first-degree murder, armed robbery and breaking and entering by a Superior Court jury Tuesday during its second day of deliberations. Gallett's girlfriend Yamiley Mathurin pleaded guilty to manslaughter earlier this month. According to CBS Boston, the trio lured Nova to a vacant house in Boston in September 2010, stabbed him 16 times, then stole their pizza order and about $140 in cash before driving off in the delivery man's car. Before the three were sentenced, Nova's relatives read their victim impact statements to his killers. The mother of Nova's four children, Marilyn Pimental took the stand first, telling the judge through an interpreter that Nova, 58, was a humble and simple person, reports the station. She cried as she recounted how she collapsed when she was told about Nova's murder. Letters from his niece, sister and other relatives were then read aloud in court. "I love you so much that I can't believe they took you away from me," the niece said in her note. Marlene Romero, one of Nova's twin daughters, then took the stand, fighting back tears as she recounted her last day with her father in September 2010. "I wish I wouldn't have let go of him," she said about hugging him for the final time. When Romero first learned her father had died, she said she didn't know what had happened. She later found out "it was done by a group of kids my age and younger." Romero said the worst feeling since her father's death has been regret, reports the station. "Nothing compares to the regret I have," she told the court. "These past four years have been hard and it never really ends. Every time I want to give up, I think about how my dad wanted the best for me," Romero said. "He wanted me to be happy." Romero's twin sister, Michelle then took the stand and also struggled through tears to tell her story about how her father never returned a phone call to her because he had been killed. "The man who was tortured that night was not just a delivery man, he was my dad," Michelle said, adding that he would never see her college graduation, wedding or grandchildren. Convicted killer Gallett addressed the court briefly Wednesday, saying he wanted to take responsibility for the brutal attack and hoped that his sentence brings peace to Nova's family. Mathurin was sentenced to 17-to-20 years in state prison Wednesday, followed by three years of probation for armed robbery.